Laurie Anne Fuhr is a former Ottawan poet and singer-songwriter now living in Calgary. Her first book, night flying, was released in Fall 2018 from Frontenac House (Calgary), and her first EP, love in the digital age, is available at https://birdheat.bandcamp.com. Laurie's poetry has been published in various magazines and anthologies, and her manuscript for night flying was shortlisted for the Robert Kroetsch Award for Innovative Poetry. 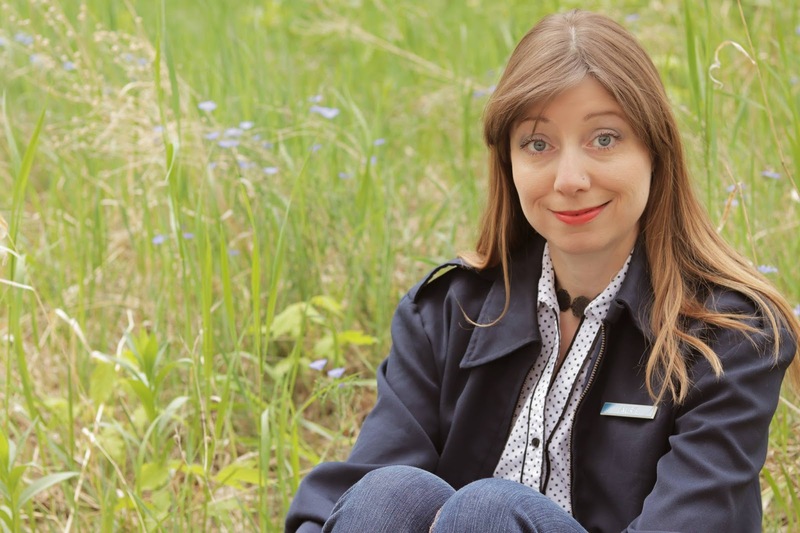 In Calgary, she instructs poetry at the Alexandra Writers Centre Society, organizes and hosts the Single Onion Open Mic, and daylights in secretarial and security. Laurie also plays upright bass in a lyrics-driven 7-piece Eastern European folk and post-punk band called Total Gadjos. Connect with Laurie via @Multimodalpoet on Facebook. Inspired by the Ottawa poetry community when I was a teenager, I made a chapbook on the family inkjet printer called Newsprint Butterflies, started blue moon cut n' paste poetry zine, and launched the micropress activities of blue moon books. Since then, I've made a few broadsides and chapbooks for classes I've run in Calgary under blue moon, but I was busiest in Ottawa and Winnipeg. It was a fun but difficult task, and it made me appreciate micropresses like above/ground that get so much done! My first chapbook that wasn't self-published was accident: a chain reaction from above/ground press. That adults might think my poetry worthwhile really encouraged me to keep writing; I am still grateful. Comparing my new work to my old work -- interesting prospect! Right now, I've noticed that I already write differently from how I wrote the book that was just released from Frontenac House, a small press in Calgary. It's got to do with the process, rather than the resulting work. When I wrote chapbook poems as a teenager, and the poems in night flying as a young adult (written 1998-2004), everything was written immediately, or in-the-moment. If I was writing about it, it was happening to me. I would often make notes during, or directly after, something happened. The work was very personal, and it took years and workshops and the hard deadline of the book to learn how to edit those very personal poems into pieces that others might like to read. Lately, I am able to write both the immediate, and about memories of things past, or about other people, ancient history, aliens, or anything else I want to, with intention. Taking workshops as well as instructing poetry has freed me from certain superstitions about writing that I didn't know I had. Poetry that you write after the fact can be just as valid, and feel just as immediate, as poetry you write in media res of your own life. However, I suspect romantic poems will always pour out at the time the romance is happening, and with a passion and excitement that could never quite be matched after the fact. That might be one superstition I don't mind holding on to 'til death do us part (me and writing). When I was a kid, I loved reading fiction, and I loved writing stories for school assignments, so technically I came to fiction first. But I was a kid living on air force bases, and I didn't know there was a community for it, or any way to publish unless you got picked up by the Big Five. I did enter a poem into the annual Legion Remembrance Day contest, and got second place for a poem in the style of John McCrae about the soldiers in his poem ascending to heaven ('In Flanders Fields we do not lie / no longer bound 'neath earthly sky', I don't remember the rest), so I thought I might have a thing for poetry. When I visited my Cold Lake skating friend Cyndi in Nova Scotia at around age 13, where she'd been posted, there was a poetry anthology in the room I stayed in, and I got into it. She saw that and gave me a pink floral notebook for a gift, and wrote inside that she hoped I would write poetry in it. We went to Peggy's Cove, and my first poem in my first poetry notebook was about that -- well actually, it about wishing the ocean would magically inspire me, and being disappointed that it didn't! My preteen voice was a little cynical. As an adult you look back and think, well of course, the ocean did inspire you because there's a poem in a book. A few years later, my friend Armour in high school who lived two doors down on Rockcliffe Base (the Ottawa base that is no longer there) put pen and paper in my hand, put on old records, and said write. There is a magic when you write knowing that someone is going to read it soon, and knowing who it will be. I had just had to give up figure skating for medical reasons, so I think my determination and passion transferred from one art to the other as a survival mechanism. Armour really encouraged me, and soon after, we walked into Cafe Wim as two kids on the lam from the 'burbs checking out the downtown underground, and there was "Hi, Steve!" running the Dusty Owl series, and all the likely characters were there, people like Ronnie R. Brown, David Collins, b stephen harding and Allison Calvern. Some guy who looked like Captain Morgan gave us poems and handbills about other readings, and the rest is history. I have definitely gotten into the prompt and freefall method. A few years back I took Stuart Ross' Poetry Bootcamp, because years before that, his readings and books launched in Ottawa sparked my imagination into a blaze of surrealistic insanity that I still draw on to warm up my work. His Bootcamp inspired me to run a Poetry Cafe in Calgary where we try different prompts every week. I get them from my own imagination, from other poets, from books (Pearl Pirie sent me some awesome resources! Thanks Pearl! ), or as suggested by our surroundings at cSpace, an arts incubator founded in an old sandstone school that houses arts of every kind. My next book will probably be random, humorous, playful, and wild when I gather up the best work I've been writing on Sundays. So far, I haven't tackled a major research project, but I've been getting excited about the Canadian Long Poem (thanks Dymphny Dronyk! ), and learning amazing things about my family history that I never knew before, so I'm going to have to do some writing. There's also a lot of work I'm sitting on that can be edited into publishable -- everything I've written since 2004! And a lot of work that didn't fit into night flying. So to answer your question, writing comes quickly, but editing could take years. Maybe I'll get the poetry of age 25 to 35 out by 45, and age 35 to 45 out by 55...if I live that long. Poems begin with something I notice in daily life that seems bizarre or otherwise noteable, or some metaphor or turn of phrase that pops to mind, or an outside prompt, whether taken at face value or twisted. I have always let them be individuals and wrangled them after, but after the recent challenge of putting together work into chapbooks and books, linked by themes or styles, chronology, or other possibilities, I have been having book ideas! The other day I was approached by a cowboy poet about doing programming at the Poet Tree on his ranch. I thought that was charming, and why not, with cowpoke experience, a book of freeverse cowboy poetry? Is it an oxymoron, or a possibility? I'm still stumped about that one. It makes me laugh, but it also excites me! What if it worked? Or what if no one read it because eww, cowboy poetry always rhymes and is full of cliches? Could I mess with expectations and cliches and make something new? Ideas like that scare me a little, because they can be risky, and risk can bring trouble or reward, there's no telling which. Without risk, though, I think we get complacent and boring as writers. My poetry might not look like the most experimental work you've ever seen, in the context of the contemporary -- my stanzas try to communicate rather than obfuscate, for the most part. I'm still trying to make meaning. But I'm constantly experimenting with who I am as a writer, and how to present my poetry, thus the @Multimodalpoet social media moniker. One good thing about having to do your own marketing as a writer is that it forces you to examine who you are as a writer. Readings are a lot of fun, and I have a feeling they are going to become even more a part of my creative process than they have been. Just yesterday I was talking to another fellow writer-musician, Jim Jackson, about collaborating on an event coming up, combining poetry and music and creating a purposeful confusion between the two in places. Another poet friend goes by BeatsxHellsHeart on Instagram, so we're going to explore some avenues with recording poems that respond to his creations, and vice-versa. Meanwhile, a couple of loop stations sit beside me on the desk. Why rule anything out? My narrative lyrics have an element of spoken word to them, and certain pieces in particular. I'll never go the slam route because I dislike a lot about it, competitive pettiness and gross behaviour and rules, but I might go entertain the spoken word kids now and then with something they haven't heard before, in a way they might not have heard it, and let them know about other local poetry events and workshops outside of their circle. Nothing will ever replace the communicative simplicity of reading from the page, though. I will always organize and participate in those readings because I think developing the skill of listening to poetry is essential to the process of becoming a better poet. Both. When I went to the Banff Centre Writing Studio in 2016, I shared my work with three major poets. They all gave me different, conflicting advice! This was freeing because I realized, no matter how many credentials an editor might have, there is much of poetry that remains subjective. eg., there is no right or wrong poetry, it's mainly a matter of taste. When it came to my first book night flying, I expected things to go differently with the editor of the press. I thought I was entitled to a thorough, substantive edit. As you know, that's not usually what you get at the small press level, at all. That was a huge wake-up call: no one is going to fix my work for me. It forced me to learn to do it better myself, and that was super difficult, but so essential. They did teach me a lot about avoiding lazy grammatical constructs and the value of immediacy in poetry, unforgettable things that will always help me as a writer, for which I am grateful. I keep looking for the quote without being able to find it, but Gertrude Stein said something to the effect of, a true artist has no critic. The way I take that is not that you should ignore criticism -- in fact, you should seek it out -- but that you should take every criticism with a grain of salt, keeping in mind that you're the artist, you're the one in control. 8 - How easy has it been for you to move between genres (poetry to songwriting)? What do you see as the appeal? It seems like I get caught up in one for awhile, and then the other for awhile. While focussed on songwriting, ideas more readily come out as songs than as poems; while focussed on poetry, I get more poems than songs. When I manage to have both going on at the same time, I get musical poems and lyrical songs. Sometimes that really works out, and sometimes it doesn't work as well. I think it has produced my best songs, but my worst poems, somehow! Every day, I still carry a notebook with me, just in case I have an idea and a chance to write it down. We are creatures of habit to the extreme however, so by instructing and participating in the Poetry Cafe I run every Sunday, I'm finding that's when my creativity is ready to flow the most. These days I am working a lot to get out of a financial hell-hole I created for myself a few years back before I had as many job prospects, and unfortunately that takes a lot of time away from creativity. One day maybe I'll do what many writers have done, and find a sugar daddy or mommy -- so far, however, I keep falling in love with fellow bohemians! 10 - What fragrance reminds you of home? Trees. Mom and Dad live in Forest Drive in Cold Lake, I used to wander around the provincial park forest when I wrote some of the poems in night flying. In Germany, we snuck under the barbed-wire fence and played in the Black Forest, not knowing until much later that they want to keep you out of there in case of "unexploded ordinance" from World War II. Trees have always reminded me of home. I feel fortunate to live beside one of Calgary's biggest parks right now. All of the above. Ekphrastic approaches to writing excite me. Reading nonfiction or watching films, going to museums, and taking in live music or plays often makes me pick up a pen, sometimes right in the dark of the theatre. A few years ago I had poems published in a Leonard Cohen anthology that were written at a Cohen concert in Vancouver. I guess it goes back to conversation about the immediate writing vs. storing experiences for later approach.. I'd tell my students, do whatever motivates you most to actually get the work done, and I should take my own advice. 12 - What other writers or writings are important for your work, or simply your life outside of your work? Favourite poets include Karen Solie and Lisa Robertson by now, but Leonard Cohen, Al Purdy, Milton Acorn, and Carolyn Forche are early influences I still return to frequently. I'm always excited to read as many contemporary Canadian poetry releases as I can get my hands on and make time to read. Stuart Ross is still my absolute favourite since his first book, and I love reading your work, too -- it always gets my brain firing poetic and has me pick up a pen. The editor of my first book night flying, Micheline Maylor, writes incredible, magic poems, and Alice Major from Edmonton writes very important political and environmental work, poems that effectively move people to deeper thought and moral action. Ottawa Review of Books just agreed to accept a review of her Welcome to the Anthropocene from me. I'm eagerly awaiting a copy of Anne Michaels' most recent poetry book that a local independent bookstore ordered in for me last week, and I'm really enjoying Liz Howard's Infinite Citizen of the Shaking Tent, she's writer in residence at University of Calgary right now. Billy Ray Belcourt's breakthrough from last year, This Wound is a World, is a must-read. Locally, Richard Harrison, Weyman Chan, and Kirk Miles are my favourites, and those they've inspired are coming out with incredible books. George Elliott Clarke and George Amabile and George Bowering -- Georges all day. But those closest to us, I find, are the most essential to our progress. In Ottawa, my friends who went to Tree and Sasquatch and Factory readings, people like Jim Larwill, Sylvia Adams, David Collins, Ronnie R. Brown, Lynn Alsford, Stephen Brockwell, jw curry, and Pearl Pirie got me going and kept me going, both with their writing and their participation in the writing community. In Calgary, their names include Bob Canuel, Pam Medland, Paul Swift, Miranda Krogstad, Leonor Henriquez, Josephine LoRe, and David Martin. David recently released his first trade press book, and I hope the others are working on theirs. If I could, I would get my favourite poets on the East side of the country read the work of my favourite poets on the West side of the country, and vice versa. Too many poets write but don't read enough. If my dysplastic hips hadn't stopped me, I was very determined to be an Olympic figure skater. By now, that career would have been over if I had made it, maybe even the Stars on Ice part, and I might be shilling for Nabisco or teaching runny-nosed kids how to do a salchow. It's my hope I would have come to poetry anyway, where anything can happen on the page -- no matter what shape your physical body is in. 14 - What are you currently working on? Currently I'm working on making extra money to come to Ottawa and launch between Christmas and New Years, and buying Christmas presents. It's hard working a lot and shopping when you'd much rather stay home and write, or head to a cafe. Wish me luck! Writing project wise, I plan to dig into some work that is ready for editing in January -- there is a workshop group I've been meaning to try out, and a blue pencil session I've signed up for with Richard Harrison. My next book is likely to contain puzzle pieces that fill in narrative gaps in night flying, when things I couldn't write about immediately, or that weren't edited to satisfaction for the book, come together. And it'll probably take us to France and Turkey, where I ended up for a few months, and which is what landed me in Winnipeg -- but that's another book and another interview.